But we’ve still got the same incredible selection of high-quality, reconditioned trucks. Head on over to our Integrity Trucks page to get a closer look! You don’t have to wait until after Thanksgiving to get a great deal at Integrity. It’s Black Friday Week, all week long at Integrity Auto Finance. We’ve got the best selection of nicer, newer, reconditioned half-ton and 3/4-ton work trucks in the State of Oklahoma. From November 19th through November 26th, we’ll match your down payment up to $1,000! Plus, if you buy a vehicle on November 19th, 20th, or 21st, you’ll also receive a $100 Retail Gift Card — perfect for your Black Friday shopping! Bad credit? No credit? That’s no problem at Integrity. Check out some of our incredible inventory in the video below, then check out our BLACK FRIDAY WEEK DEALS page to see even more! You don’t have to wait until after Thanksgiving to get a good deal – all week long, we’ll match your down payment up to $1,000! It’s Black Friday Week at Integrity Auto Finance! We’ve got the best selection of Half-Ton and 3/4-Ton Trucks in Oklahoma! Check out this 2011 Dodge Ram 1500. It’s a four-door, 4X4, with a 5.7-liter Hemi and 20-inch offroad tires and wheels! We’ve got this 2012 Ford F-250 Lariat – FX4 Offroad Package. It’s a 4X4, pearl white with tan leather, heated and cooled seats and navigation. It’s fully reconditioned and ready to go to work for you! This sporty red Chevy Silverado is a V8 crew cab with brand new 20-inch tires and wheels! Don’t worry about your credit – we are the bank! We’ll get you into a heavy-duty truck that’s ready to work just as hard as you do! 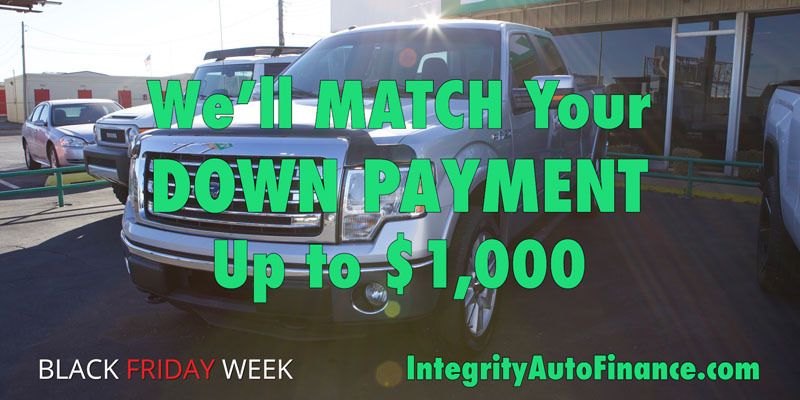 We’ll match your down payment up to $1,000! And: buy a vehicle on November 19th, 20th, 21st, or 23rd, and receive a $100 Retail Gift Card with your purchase! Perfect for spending on Black Friday! Get down to Integrity today and take advantage of our BLACK FRIDAY WEEK! Click here to check out our BLACK FRIDAY WEEK DEALS page!